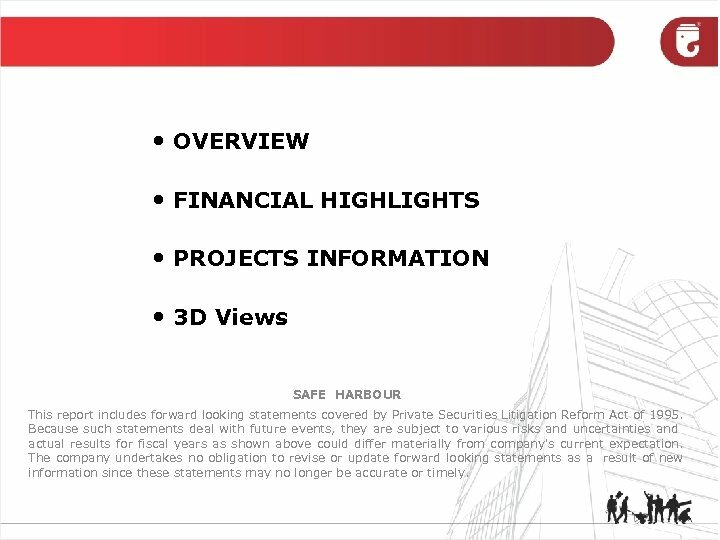 OVERVIEW FINANCIAL HIGHLIGHTS PROJECTS INFORMATION 3 D Views SAFE HARBOUR This report includes forward looking statements covered by Private Securities Litigation Reform Act of 1995. Because such statements deal with future events, they are subject to various risks and uncertainties and actual results for fiscal years as shown above could differ materially from company's current expectation. The company undertakes no obligation to revise or update forward looking statements as a result of new information since these statements may no longer be accurate or timely. GHCL OVERVIEW ü Over 43 years of experience ü 17. 5 million Sq. Ft. of residential development completed ü INR 2. 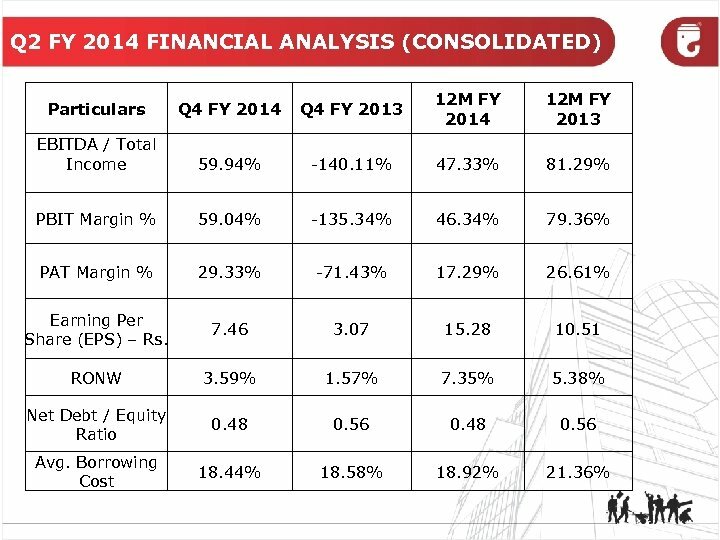 88 Billion in Annual revenue in FY 14 ü 1. 70 million Sq. Ft. of residential development in progress ü 0. 54 million Sq. Ft. of commercial development in progress ü Developable land area with the company as on 31 st March, 2014 is approx. 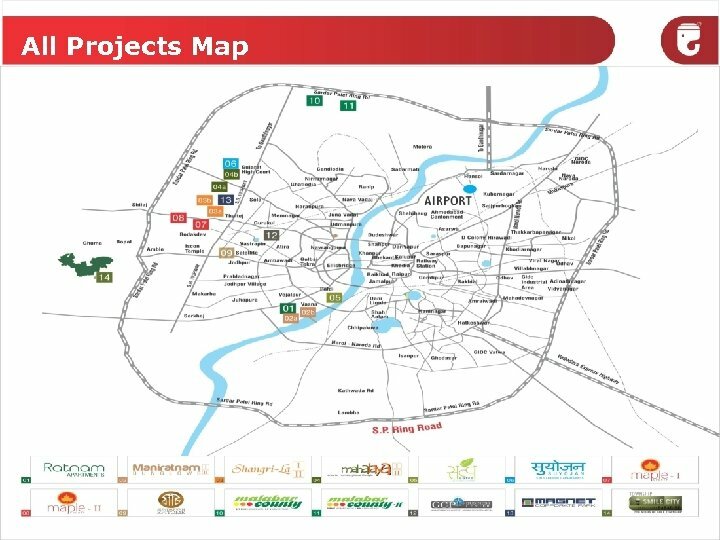 614 acres within Ahmedabad. ü 26. 06 million Sq. 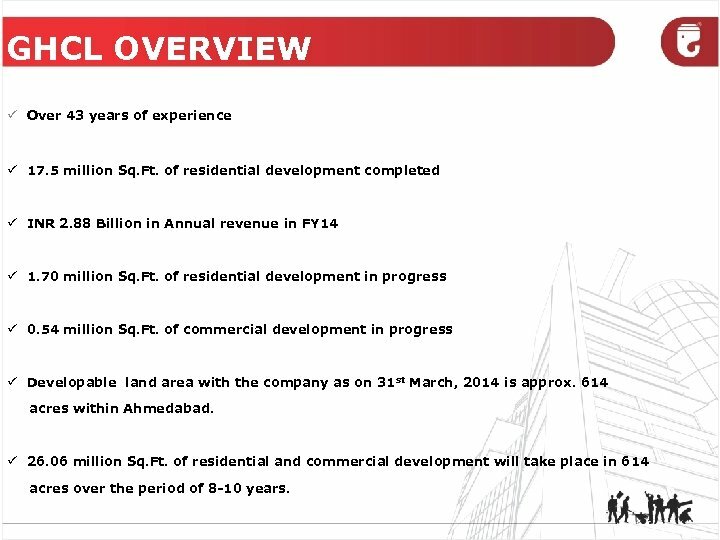 Ft. of residential and commercial development will take place in 614 acres over the period of 8 -10 years. 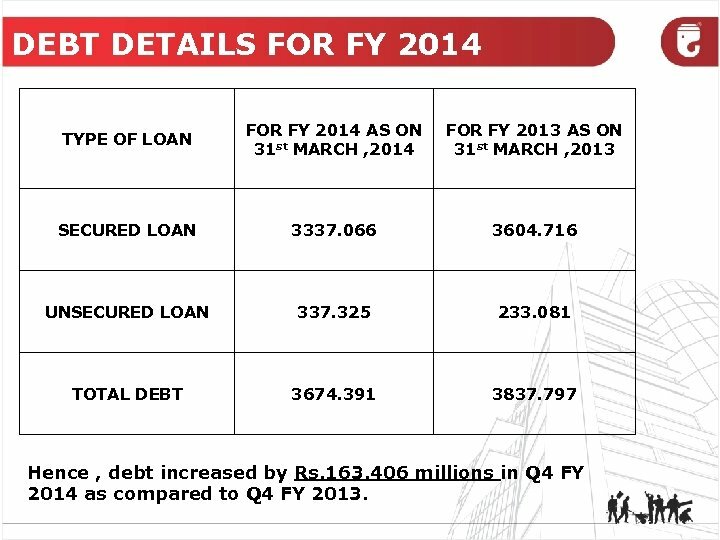 DEBT DETAILS FOR FY 2014 TYPE OF LOAN FOR FY 2014 AS ON 31 st MARCH , 2014 FOR FY 2013 AS ON 31 st MARCH , 2013 SECURED LOAN 3337. 066 3604. 716 UNSECURED LOAN 337. 325 233. 081 TOTAL DEBT 3674. 391 3837. 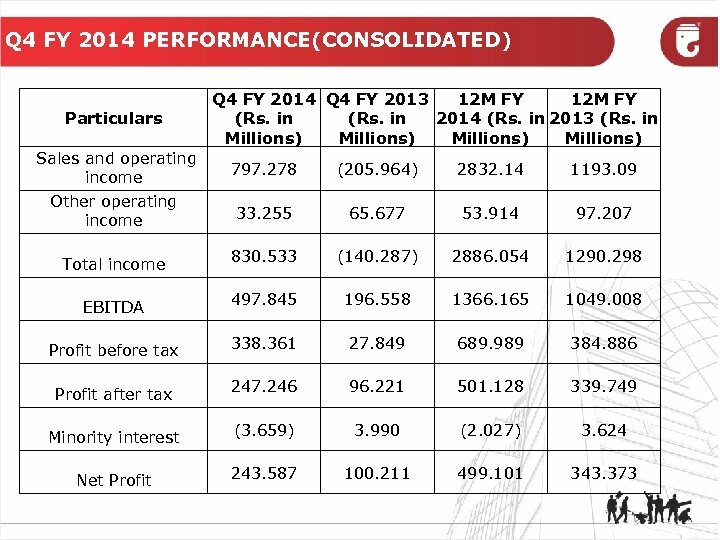 797 Hence , debt increased by Rs. 163. 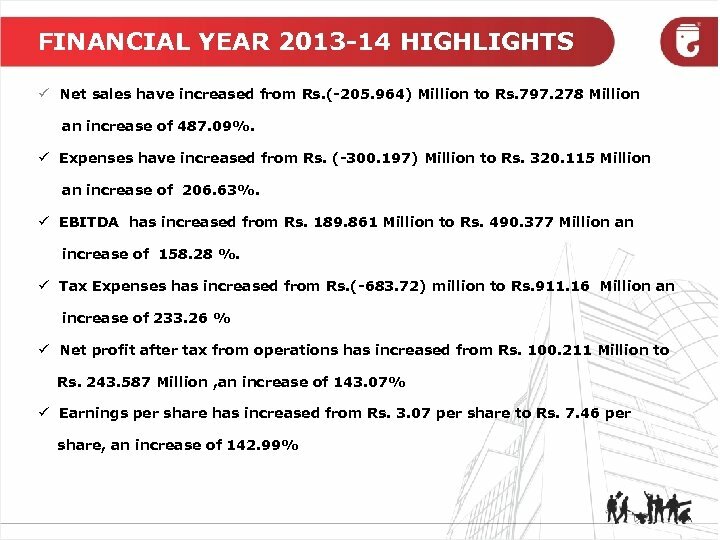 406 millions in Q 4 FY 2014 as compared to Q 4 FY 2013. 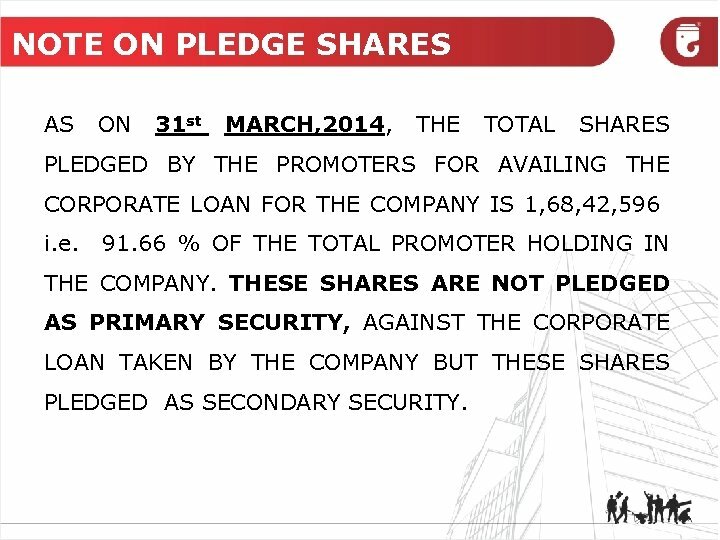 NOTE ON PLEDGE SHARES AS ON 31 st MARCH, 2014, THE TOTAL SHARES PLEDGED BY THE PROMOTERS FOR AVAILING THE CORPORATE LOAN FOR THE COMPANY IS 1, 68, 42, 596 i. e. 91. 66 % OF THE TOTAL PROMOTER HOLDING IN THE COMPANY. THESE SHARES ARE NOT PLEDGED AS PRIMARY SECURITY, AGAINST THE CORPORATE LOAN TAKEN BY THE COMPANY BUT THESE SHARES PLEDGED AS SECONDARY SECURITY. 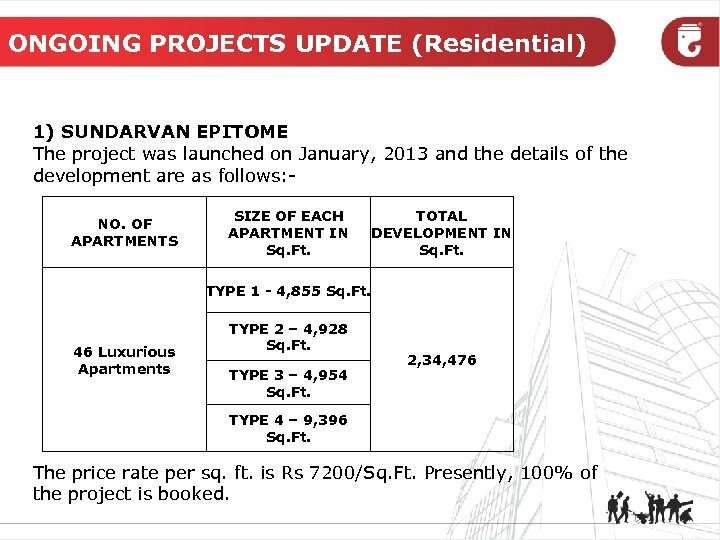 ONGOING PROJECTS UPDATE (Residential) 1) SUNDARVAN EPITOME The project was launched on January, 2013 and the details of the development are as follows: NO. OF APARTMENTS SIZE OF EACH APARTMENT IN Sq. Ft. TOTAL DEVELOPMENT IN Sq. Ft. TYPE 1 - 4, 855 Sq. Ft. 46 Luxurious Apartments TYPE 2 – 4, 928 Sq. Ft. TYPE 3 – 4, 954 Sq. Ft. 2, 34, 476 TYPE 4 – 9, 396 Sq. Ft. The price rate per sq. ft. is Rs 7200/Sq. Ft. Presently, 100% of the project is booked. 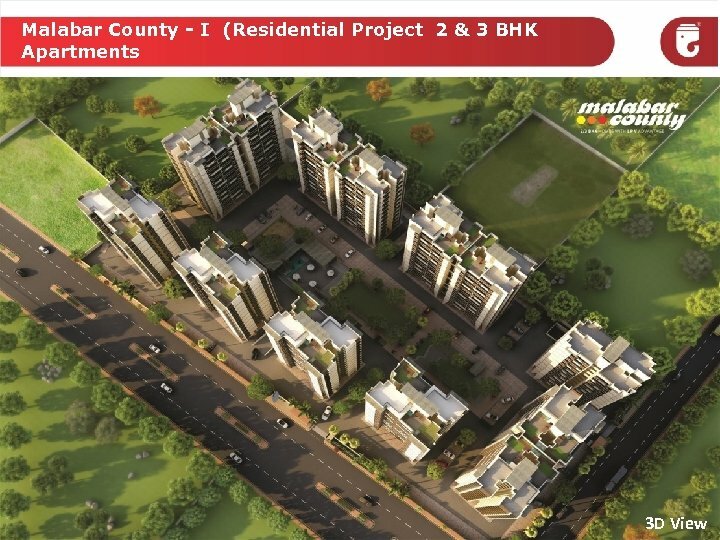 ONGOING PROJECTS UPDATE (Residential) 3) MALABAR COUNTY ( CHHARODI) The project was launched on March 2013, and the details of the development are as follows: NO. 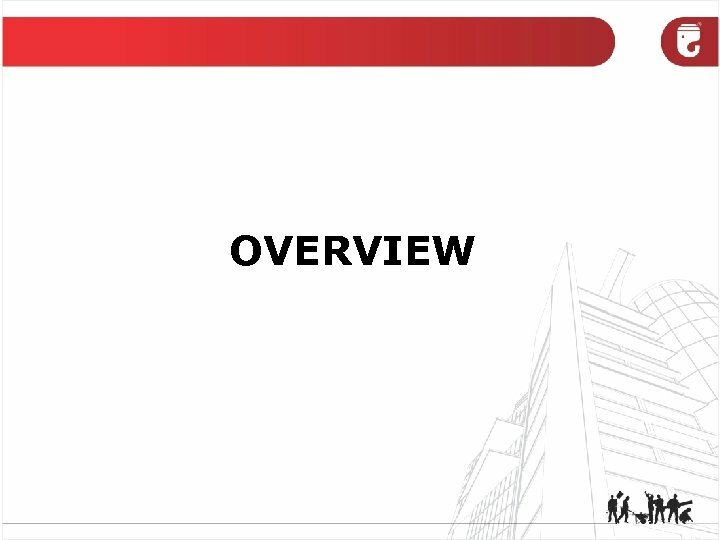 OF APPARTMENTS SIZE OF EACH APARTMENT IN Sq. Ft. TOTAL DEVELOPMENT IN Sq. 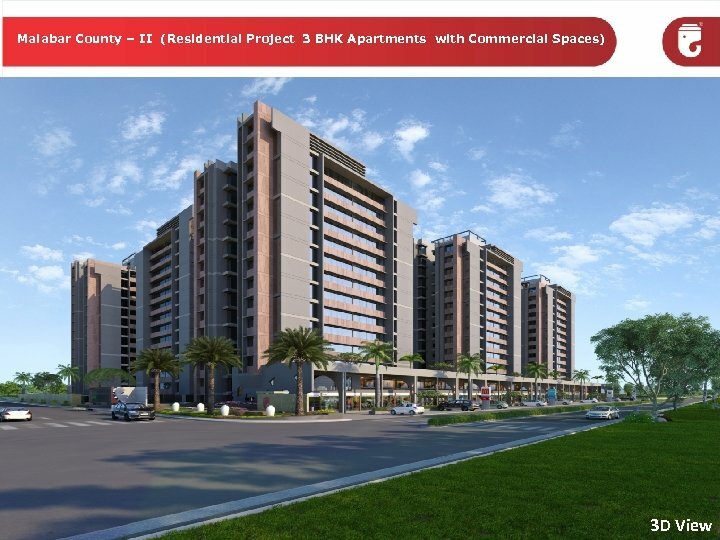 Ft. 3 BHK – 1482 Sq. Ft. 600 NOS. (INCLUSIVIE OF ALL TYPES) 2 BHK – 1167 Sq. Ft. 7, 51, 072 Sq. Ft. 2 BHK – 1168 Sq. 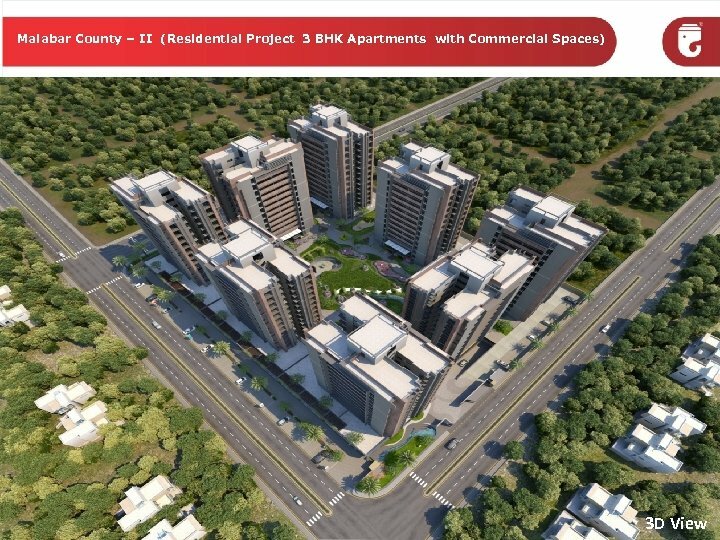 Ft. 2 BHK – 1133 Sq. Ft. 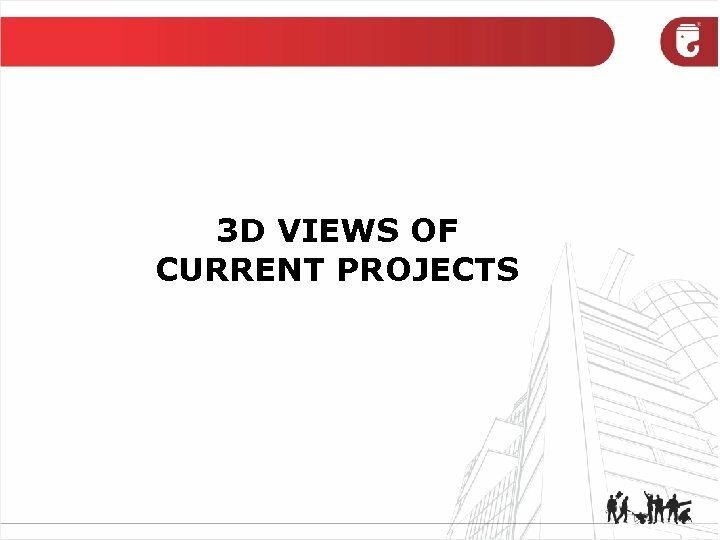 The project is 98% booked and the average realization rate is Rs. 2700 / Sq. Ft. 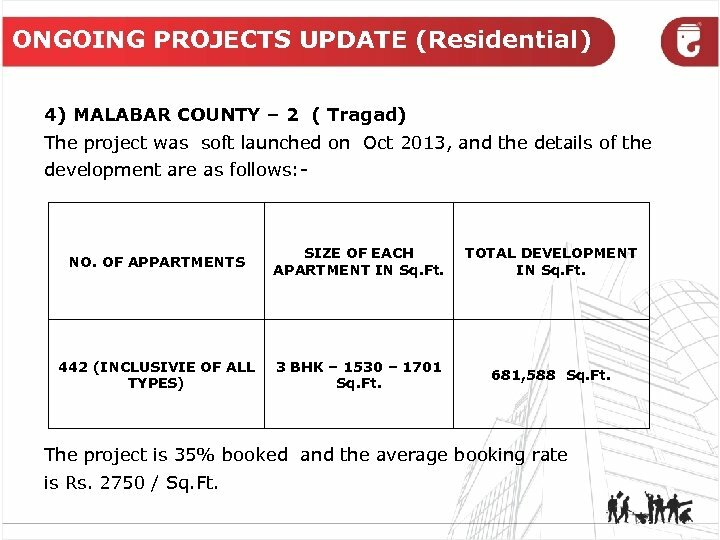 ONGOING PROJECTS UPDATE (Residential) 4) MALABAR COUNTY – 2 ( Tragad) The project was soft launched on Oct 2013, and the details of the development are as follows: - NO. OF APPARTMENTS SIZE OF EACH APARTMENT IN Sq. Ft. TOTAL DEVELOPMENT IN Sq. 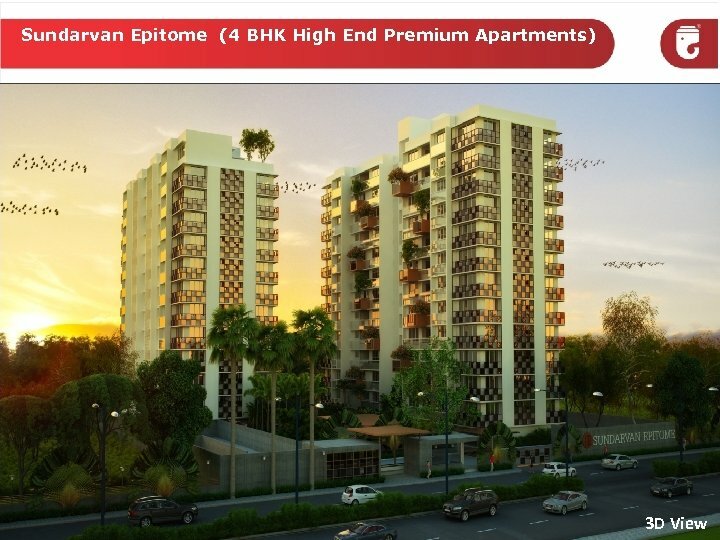 Ft. 442 (INCLUSIVIE OF ALL TYPES) 3 BHK – 1530 – 1701 Sq. Ft. 681, 588 Sq. Ft. 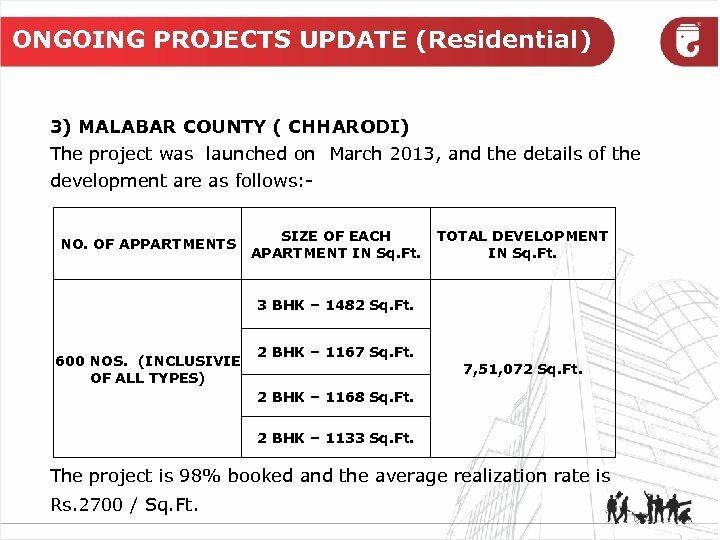 The project is 35% booked and the average booking rate is Rs. 2750 / Sq. Ft. 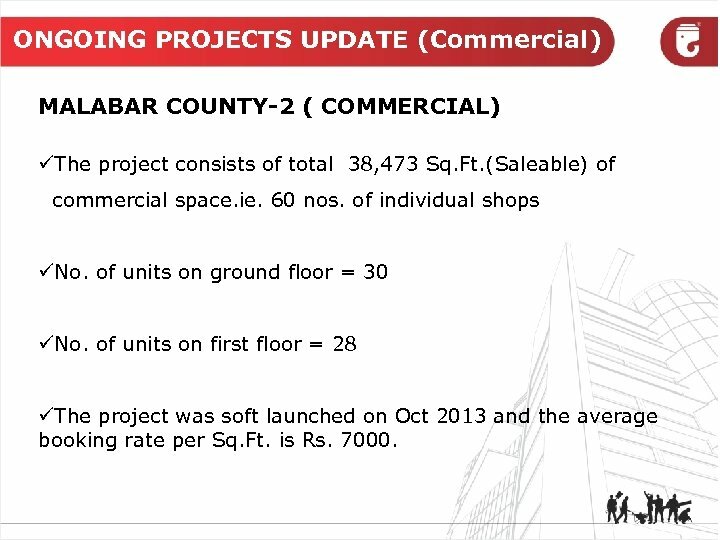 ONGOING PROJECTS UPDATE (Commercial) MALABAR COUNTY-2 ( COMMERCIAL) üThe project consists of total 38, 473 Sq. Ft. (Saleable) of commercial space. ie. 60 nos. of individual shops üNo. of units on ground floor = 30 üNo. 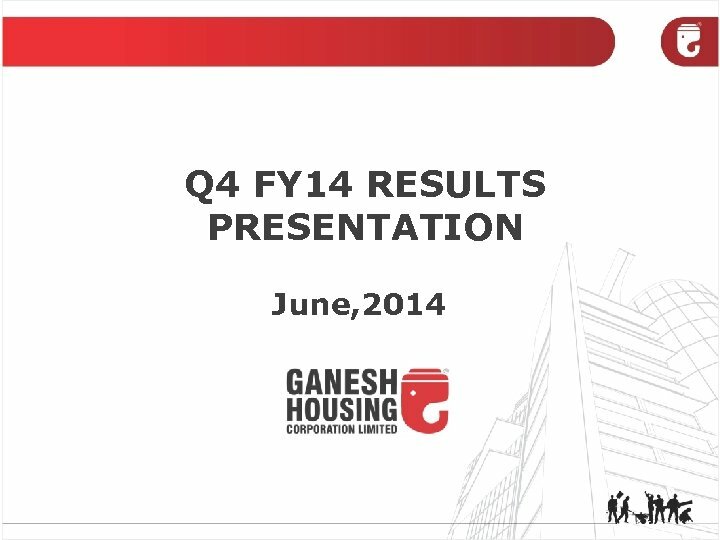 of units on first floor = 28 üThe project was soft launched on Oct 2013 and the average booking rate per Sq. Ft. is Rs. 7000. 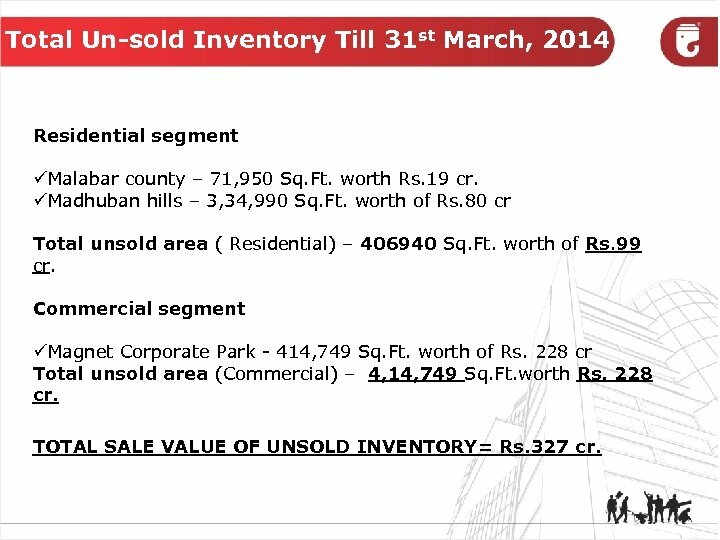 Total Un-sold Inventory Till 31 st March, 2014 Residential segment üMalabar county – 71, 950 Sq. Ft. worth Rs. 19 cr. 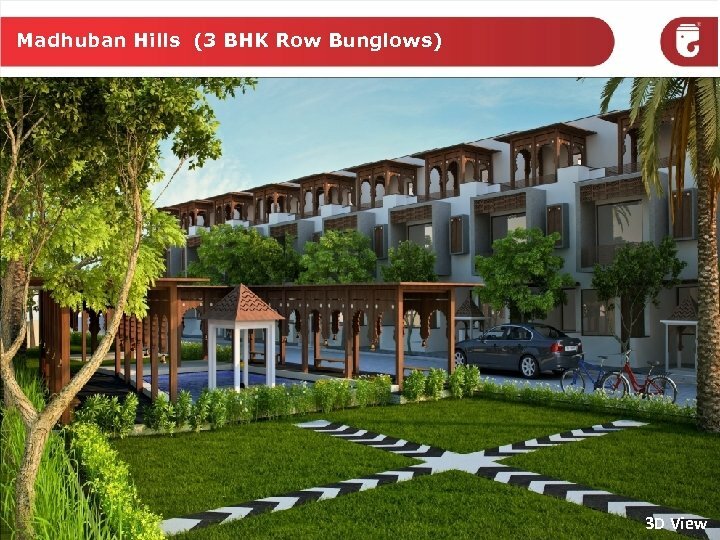 üMadhuban hills – 3, 34, 990 Sq. Ft. worth of Rs. 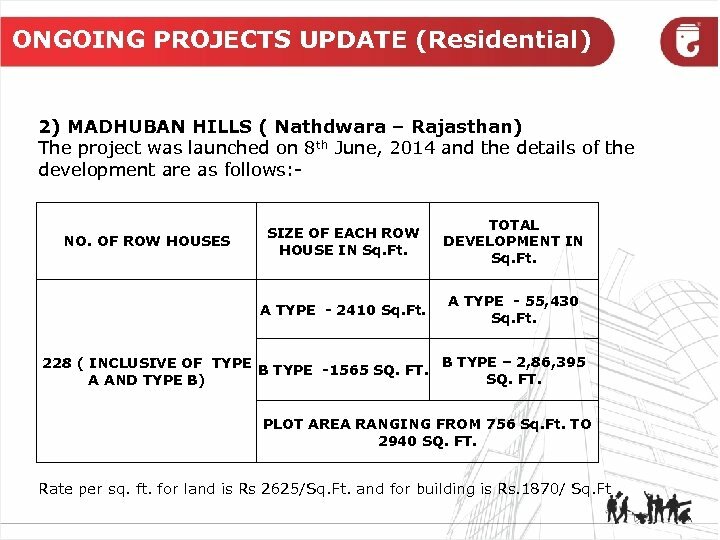 80 cr Total unsold area ( Residential) – 406940 Sq. Ft. worth of Rs. 99 cr. Commercial segment üMagnet Corporate Park - 414, 749 Sq. Ft. worth of Rs. 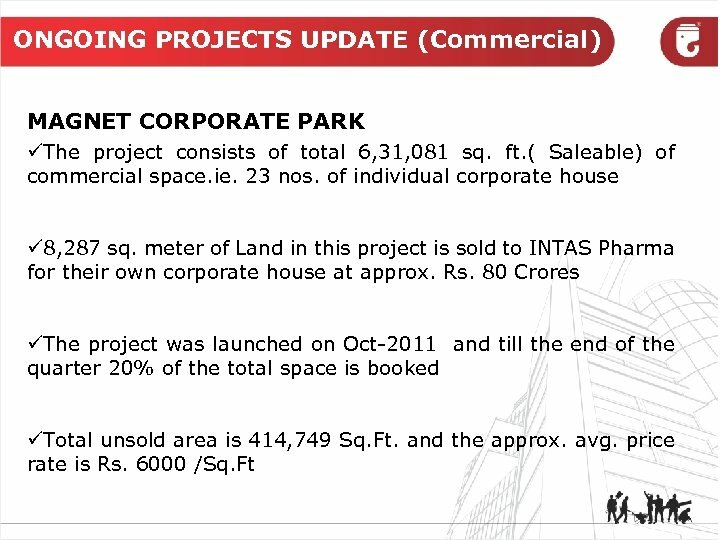 228 cr Total unsold area (Commercial) – 4, 14, 749 Sq. Ft. worth Rs. 228 cr. TOTAL SALE VALUE OF UNSOLD INVENTORY= Rs. 327 cr. 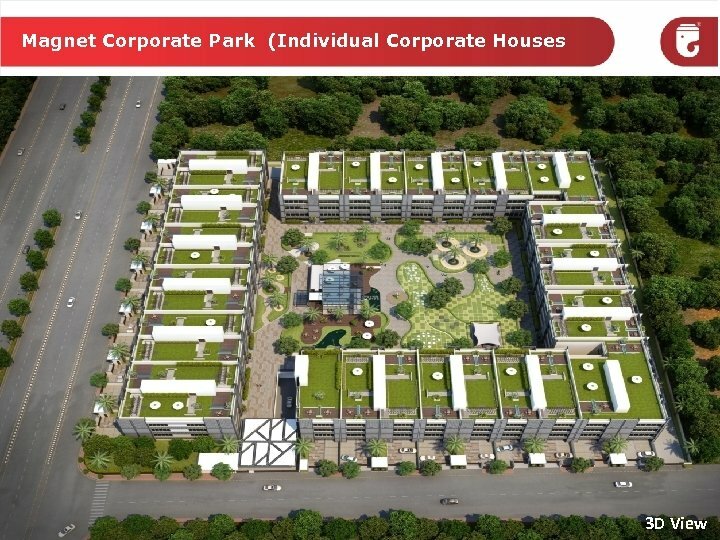 COMPANY OUTLOOK P New projects such as Malabar county, Sundarvan Epitome, Magnet Corporate Park and Madhuban Hills have been launched in last 30 months. 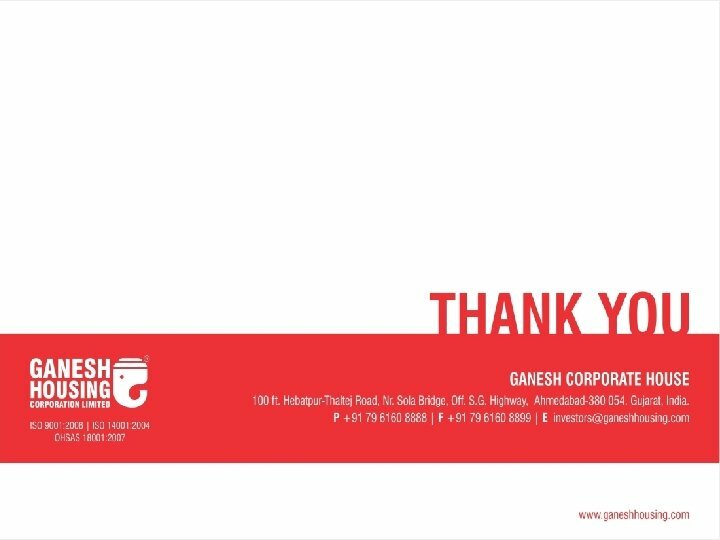 Total saleable area of the above mentioned projects is 18, 42, 977 Sq. Ft. The cost and sales details of these projects are as under P The Company has estimated a total construction cost of Rs. 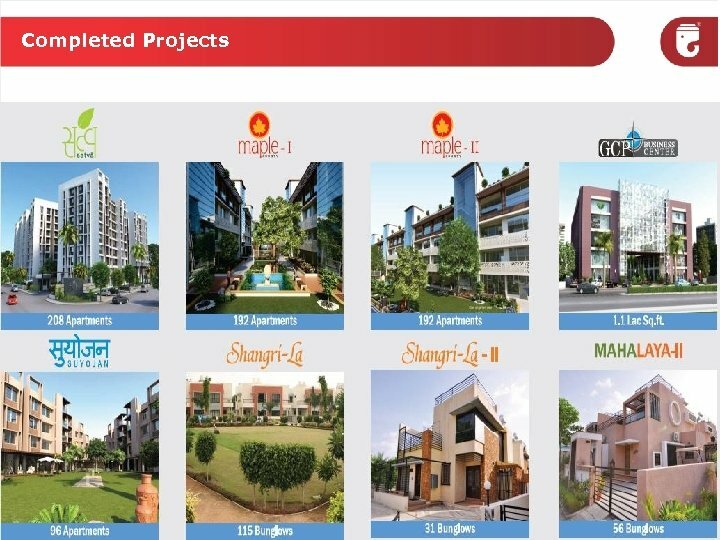 2156 millions for Malabar County , Sundarvan Epitome, Magnet Corporate Park and Madhuban hills projects. Till the end of this quarter, we have incurred Rs. 1095. 9 millions towards the construction cost of the above mentioned projects. Remaining Rs. 1060. 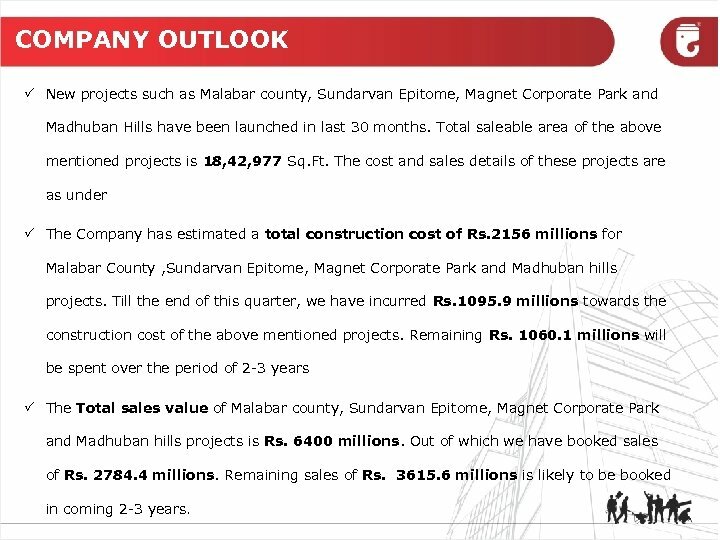 1 millions will be spent over the period of 2 -3 years P The Total sales value of Malabar county, Sundarvan Epitome, Magnet Corporate Park and Madhuban hills projects is Rs. 6400 millions. Out of which we have booked sales of Rs. 2784. 4 millions. Remaining sales of Rs. 3615. 6 millions is likely to be booked in coming 2 -3 years.